Galaxy Far Away Fest has been described as "A rift in time and space, where all of your favorite sci-fi and intergalactic genres mix together upon a singular plane of existence..." Every year we gather to celebrate our love of sci-fi culture and science, by dressing up and gettin' down!! The organization hosts and promotes workshops, demonstrations, classes and events in the fields of Art and Science. GFAF also participates in other community building activities such as helping other non-profits and local organizations achieve their missions. The foundation strives for inclusion by creating events that are accessible to all ages, creeds, orientations and socioeconomic backgrounds. Stay tuned for updates on 2019's Fest, coming soon! Please follow us on FB to stay up to date on our other events and fundraisers as well as the fest and IG for a fun look at GFAF. Harry Potter and the Order of the Phoenix Trivia! 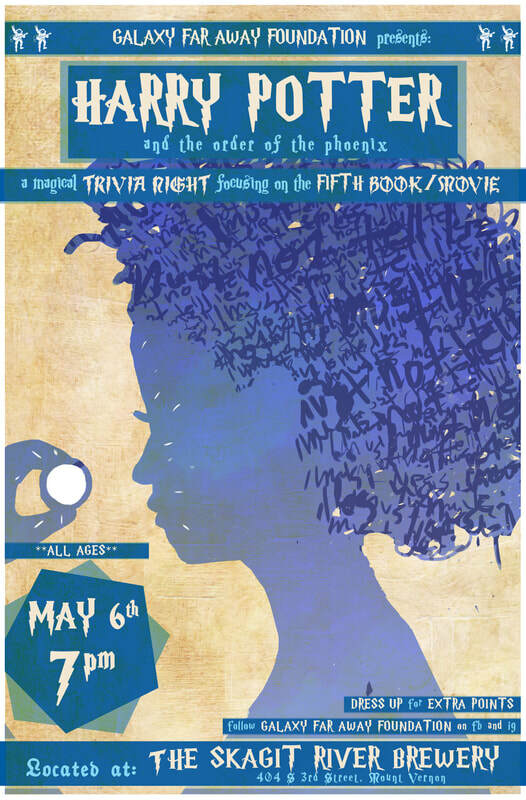 Monday May 6th HP trivia returns to the Skagit River Brewery with Book/ Movie 5, the Order of the Phoenix! 7-9pm, All ages and no cover, with prizes! Dress in HP cosplay to earn bonus points for trivia! Donations collected go directly to GFAF to help with our mission and operating costs. In 2018 GFAF collected and donated over 1,000 pounds of clothing and bedding to local organizations! We are now eligible for Amazon Smile donations! Just follow the link or add Galaxy Far Away Fest as your Smile non profit and Amazon will donate a percentage of your purchases to our 501(c)3!